is good. The game's been out for a while, but I'm slow to complete things. I got it for my birthday, the same week it came out (Thanks Ma). If you care enough to read this, chances are you're at least familiar with it, so I'll leave out some of the stuff that's been said over and over on gaming blogs and review sites. I was a big fan of Indigo Prophecy, which I played on the PS2 back in good ol' 2008. It was made by the same company, quanticdream, and described as a "movie you play". Indigo Prophecy was one of few games I've seen (because I don't regularly play Bioware or Bethesda games) to include conversation and small actions like taking a pee in its core gameplay. 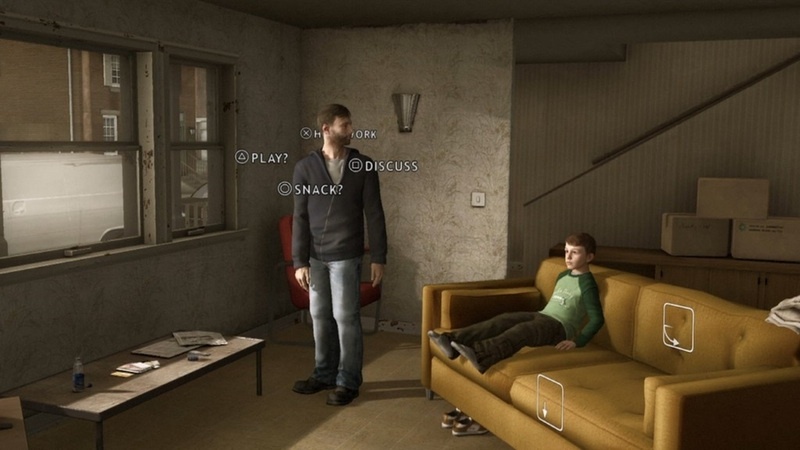 It worked by allowing you to walk around and "interact" with objects, like dirty dishes or doorknobs. You would do the bulk of the interaction with the right analog stick, pointing it down and then "hooking" it to the right and up to turn the handle. Conversations in the game, which at crucial points could change the outcome of the story, were the most engaging part of it. 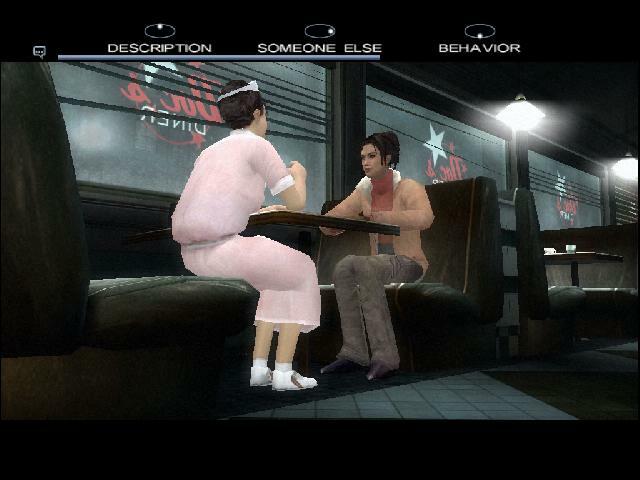 In one instance you play as an innocent wanted man who is talking to a police detective who suspects you. When asked a question by her, you have four options like "Get angry", "Joke", "Evade" and "Lie". You have a visible limited amount of time to read these options and then decide. The process is very exciting, creating a small panic as you decide what to do. The element, or at least illusion of, choice in videogames has been something developers have been trying to get right (or achieve at all) for a while now, and this game has done it as well as I can imagine it being done. The developers can't program and record dialog for too many divergent story paths. They'd have to record an impossible amount of dialogue to make the story truly organic and changing like that, but here they at least created a feaux sense that anything you do can change the direction your characters go. This mechanic returns in Heavy Rain, and it's as functional as ever, except you use the face buttons on the controller instead of the analog stick for conversations (see it here, start at 2:50). The stick is still used for interactions. Quanticdream has done some clever things with the object interaction in Heavy rain, though Indigo Prophecy's DDR-with-buttons style of combat returns. They have at least thrown in some stickwork to go with the button fighting this time. The most interesting thing I've seen so far, though, is how it handles characters' interaction with tight spaces and fine handiwork. For example, a character may have to squeeze through a narrow alley or carefully step over a wire without touching it. In instances like these, the player must press one button and hold it down. Let's say the first button is the R1 button, which instinctively you press with your index finger. Next, you are prompted to press the Triangle button (while still holding R1), which you press with your thumb. Then, with these two buttons still pressed, you must press the X button. This mechanic can get tricky and will twist your hand into something weird on more than one occasion, sometimes causing you to use your nose or a nearby solid object. I don't know why, but doing this feels EXACTLY like what squeezing through a tight space feels like. The brain must be wired in such a way that pressing buttons this way and carefully stepping over something are controlled in the same center. That's my guess anyway. The graphics are fantastic too. I'm no graphics whore, but like most gamers I at least like my games to look good -- as long as it's Half-Life 2 graphics I'm pretty much set. This game, though, is ridiculously well-drawn. You are treated to ultra high-res models of the characters' faces while the game loads, something you've got to see if you haven't. All of the modern lighting effects are included, with the "shiny" thing I hate toned down as much as possible. Every actor looks fantastic while they are talking or performing an action. The only problem with the graphics lies in the fact that gaming art technology is at a weird point in its development. We are entering what many people call the uncanny valley. The acting and art are spectacular, but not quite there. It's like the actors are a little too expressive at times. When a child in the game is supposed to be happy about something, he will clap and grin a lot. I know the developer is trying to showcase what emotions they're capable of capturing, but there's also something to be said for subtlety, guys. Lots of times a glance to the side, a slight pause or a small smile can be more affective than big, obvious expression of "happy". Other than that, though, it's well acted. I recommend picking it up, especially if you're interested in games as an evolving medium and not just entertainment. I recently accidentally deleted my savegame two thirds of the way through, so I'm starting over. More on the game hopefully when I finish.